One issue I’ve seen brought up more than once is how to use cloth diapers at night without leaks. If you’re looking for solutions, then you’ve either experienced a great deal of leakage trying to use your daytime system or you’re worried that it just simply can’t handle as much as a disposable can. Fear not! 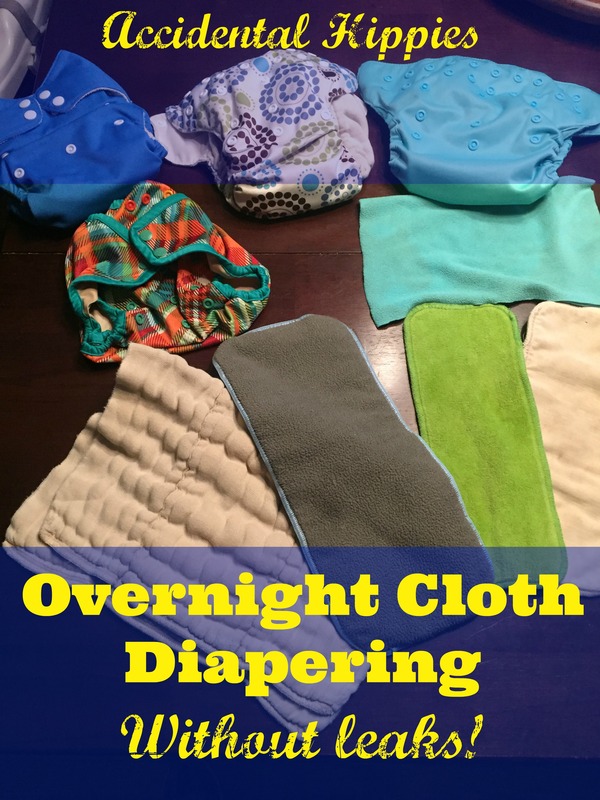 Whether your tiny baby is sleeping long stretches or your heavy wetter toddler sleeps 12 hours all night long, you CAN successfully cloth diaper at night. Realistically, you only need to augment your existing system for a few hours. 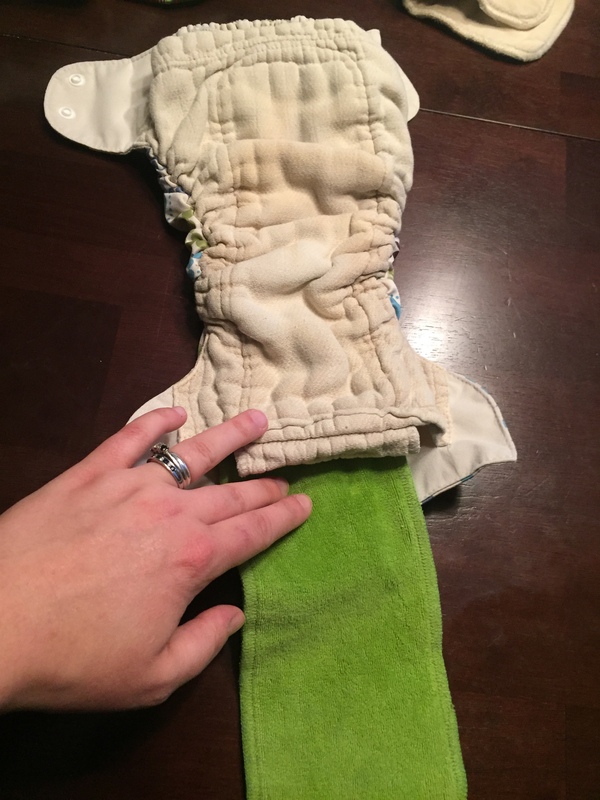 For most people, this might be adding some super absorbent doublers, using fitted diapers instead of pockets or all-in-ones, or putting a wool cover over everything. Doublers (smaller with fewer layers) and Inserts (larger with more layers) are absorbent pads that you can add to your existing diapering system. You can add them into your pocket diaper; lay them in your all-in-one, all-in-two, or hybrid; or add them to your prefold, flat, or fitted diaper. They come in many different materials from cotton, to hemp, to bamboo fleece. 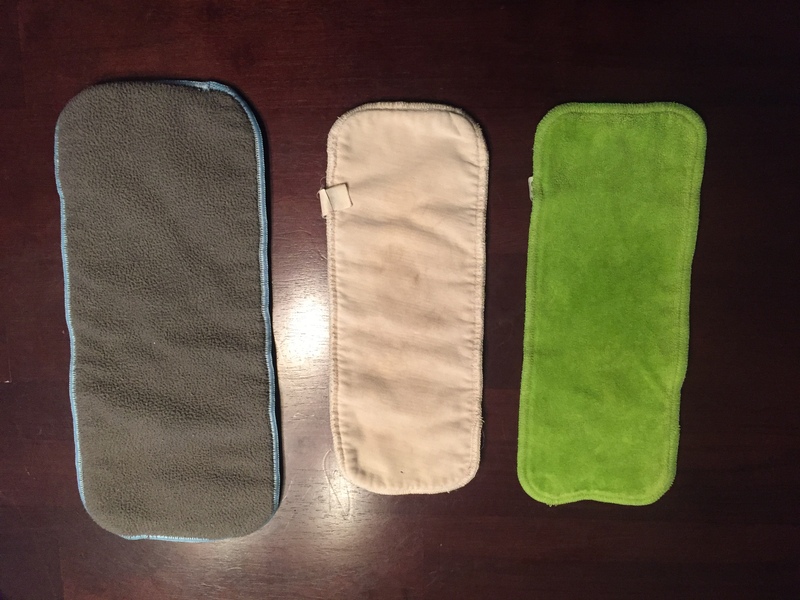 My favorites have been bamboo fleece because they have been super absorbent and stay-dry. The hemp inserts are my go-to once I run out of bamboo. Cotton if it’s naptime and I only need a little boost. I add a doubler on the inside of the prefold against the skin and then put the cover on over everything. Provided I haven’t left any of the fabric hanging out of the cover, he stays dry all night long! Blueberry Simplex All In One with small size Thirsties Duo Fab Insert simply put on top – this particular AIO diaper seems smaller than many of my other diapers despite being a one-size diaper, so I would use a smaller insert with these. The Blueberry Simplex AIO has a pocket for its own attached insert, into which you can easily stuff another insert. Since this diaper is open on both ends, you don’t have to unstuff if — it will just agitate out in the wash! 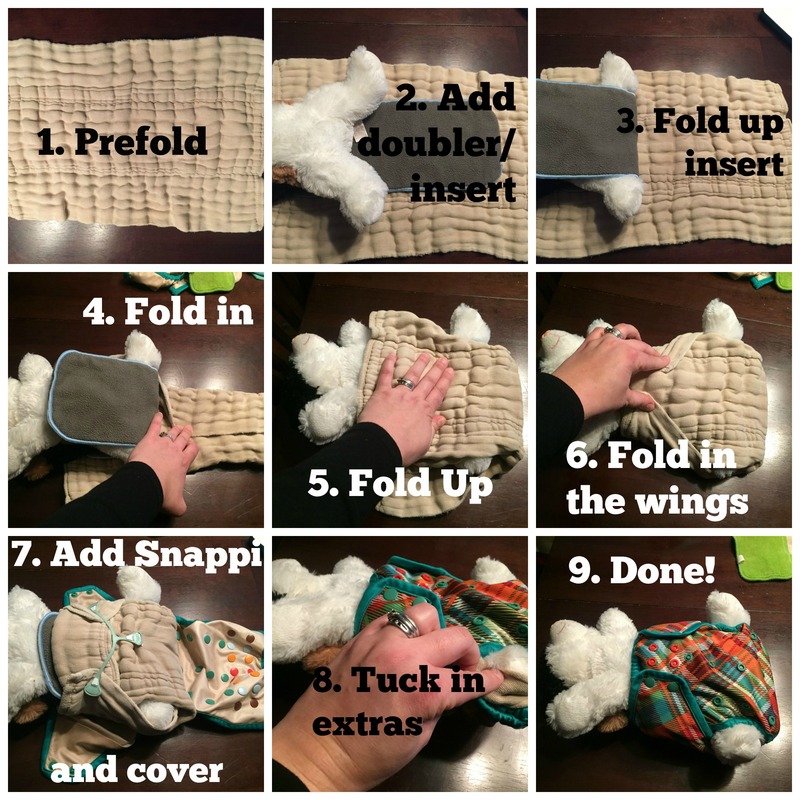 The Imagine pocket diaper only has one opening at the back of the diaper for stuffing, so it needs to be unstuffed before being put in the diaper pail for washing. A fitted diaper looks a bit like an all-in-one but without a waterproof outer. The ENTIRE diaper is absorbent from the middle to the wings, inside and out, meaning it can hold a LOT of liquid through a long night. In that sense, it’s a lot like a prefold but a bit easier to manage perhaps more refined. They cost quite a bit more than just getting some extra inserts, but you only need a few of them to get you a few nights until laundry day, and for the performance it’s worth it. For example, check out this One Size Organic Fitted from Babykicks or the Thirsties Duo Fab Fitted at Kelly’s Closet. 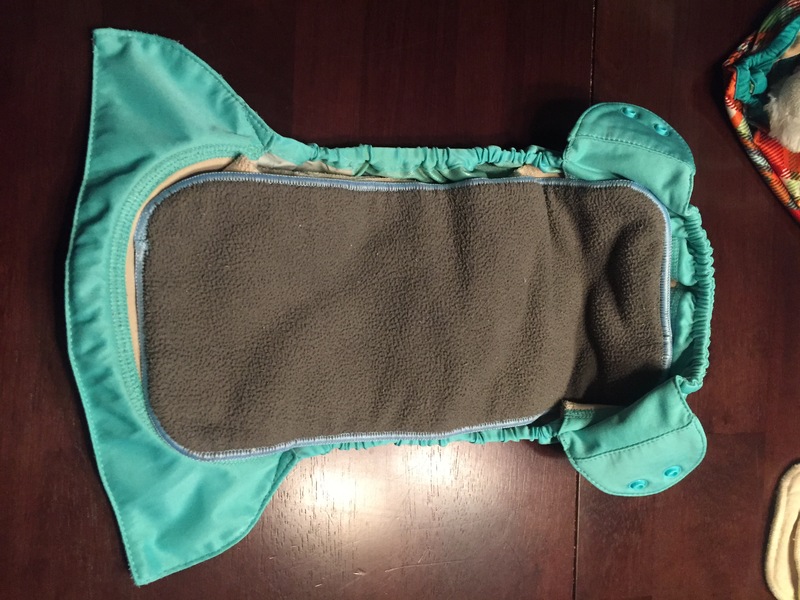 Wool covers are so water repellant that some people consider them their silver bullet for nighttime diapering. Check out this one from Sustainablebabyish at Kelly’s Closet. The wool does need to be lanolinized before use, and over time does require a bit of special care compared to other solutions. It also is pretty pricey, but by all accounts it is a GREAT solution for keeping everything in. Fleece covers work in a similar way without the extra care but may not be quite the workhorse that wool is. I realize that you’re trying to get away from disposable anything if you’re using cloth diapers, but hear me out on this one. We went through a phase when Wee Man was about 12-18 months where he was not only a very heavy wetter, but also rash prone for some reason. The ONLY thing that helped clear up his skin AND keep him leak-free all night was putting a gDiaper disposable insert against him inside of his prefold. By morning, his skin was noticeably healed and his clothes and sheets were dry. The insert was soaked and his prefold was wet but not dripping. Since we only had to use one per night and none during the day, the cost of this wasn’t something I was too concerned about. Once he had healed from the rash, I found the charcoal bamboo inserts and haven’t looked back. Natural fibers tend to work the best. Your mileage may vary, but typically cotton, hemp, and bamboo do the best (in order of absorbency). Microfiber tends not only to be less absorbent than natural fibers, but to also experience more issues with ammonia build up. Stay-dry isn’t always better. This is especially true if you use pocket diapers or other diapers lined with fleece or suede cloth. These fabrics tend to delay soaking up the liquids (hence the “stay-dry” aspect of them) and therefore make it likely that the liquids will find their way out of the diaper and onto clothes and bedding. It isn’t usually as big of a problem during the day when baby is sitting, standing, and moving around, but can be a huge hassle at night when baby is laying in one spot and not putting much downward pressure on the diaper itself (the pressure is what helps it to absorb faster). If you are experiencing leaking at night with pocket diapers or other systems with a stay-dry top, this could be why. Natural fibers soak up liquids immediately and don’t allow time for leakage unless they are soaked beyond capacity. More inserts aren’t always the answer. This is especially true for pocket diapers, but applies to all diaper types. The more you stuff a diaper, the further away from the baby it gets, allowing leg gaps that create leaks. I experienced this when I’d try to stuff one or two extra inserts into my pockets. When I simply changed my type of insert to one super absorbent one rather than several inserts, I had greater success. 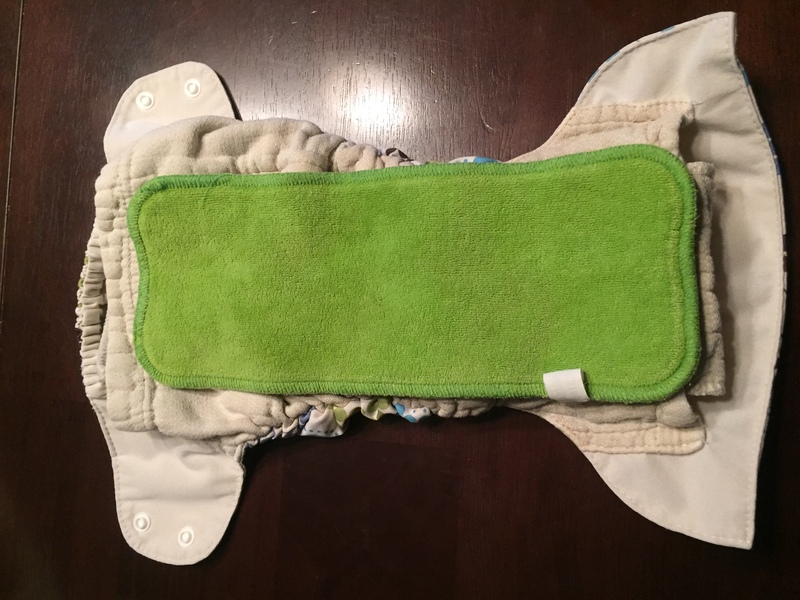 I also had greater success using prefolds and extra inserts at night rather than trying to double or triple stuff a pocket diaper or all-in-one. 1. Avoid gaps. This was touched on above but I can’t stress it enough. If you have gaps around the legs or waist, you will have leaks. Make sure you have a snug fit all around. 2. Keep it tucked in. A lot of people get leaks day OR night because the inner fabric is hanging out of the leg holes, causing the liquids to wick out and onto your little one’s pajamas and bedding. If you use prefolds, flats, or fitteds, make sure all of the fabric is inside of your cover and isn’t hanging out. If you’re using all-in-ones, all-in-twos, hybrids, or pockets, make sure all of the outer waterproof fabric is rolled in around the legs and waist. For pockets especially, check at the back and waist to make sure the pocket is fully closed and not hanging open. 3. Make sure it all fits. A diaper that isn’t fitting your baby snuggly will likely experience leaks. Similarly, if you’re trying to use inserts that are too big for your baby or the diaper, it’ll be hard to keep it contained. 4. Embrace trial and error. You’ll likely experience leaks as you try to refine the system that works best for you. The best thing to do is examine WHY it leaked and try to fix it from there, whether it was from wicking, poor leg seal, diaper too loose, etc. Don’t be afraid to experiment a little bit to find the best solution for you! There you have it! 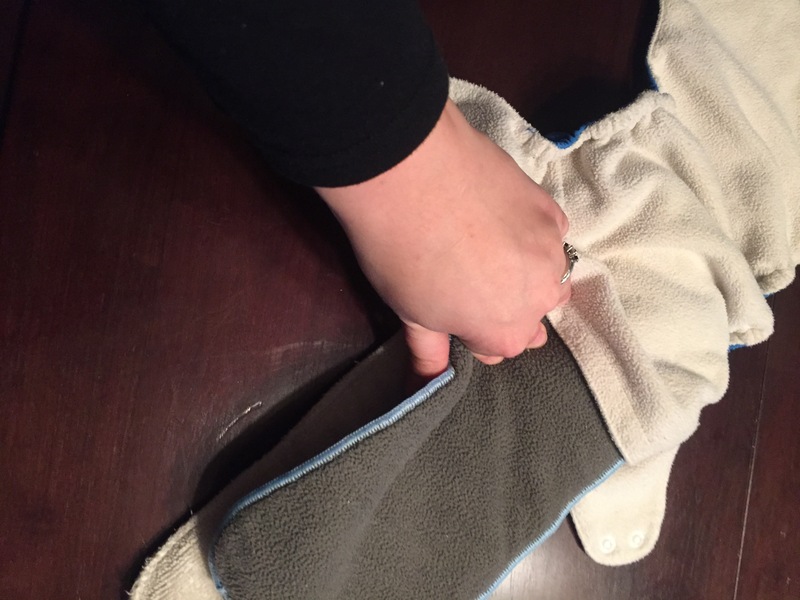 Nighttime diapering doesn’t have to be a hassle. You just have to find a way to adapt your daytime system that works for you and your baby. What system has worked best for you? I’d love to hear your experience in the comments below, or hit me up on Facebook and Twitter.